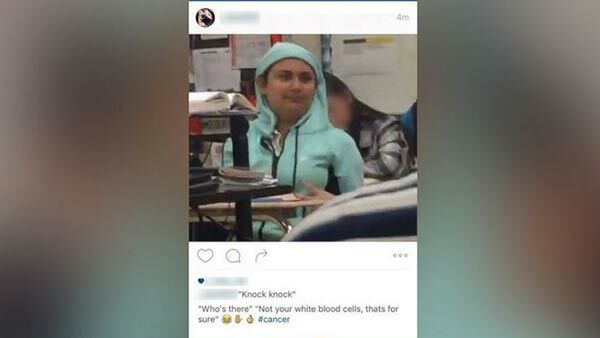 LAREDO, TX -- A Texas teenager, who faced online taunting from classmates over her cancer diagnosis, is now getting support from her comrades, according to ABC News. Nicole Pfister, 14 of Laredo, Texas, has been battling a "high risk" form of leukemia, according to a Facebook page run by her parents. It was her diagnosis itself, that led some other students to mock her on social media. One user wrote "Knock, knock, who's there 'Not your white blood cells, that's for sure,'" according to a post on the "Team Nicole" Facebook page. Another user wrote "embarrassing" and "kill yourself" under a picture of Nicole. School officials told ABC News that they were made aware of hateful comments yesterday and are already talking to the students involved. "We took the information and this morning I talked to the administrator at the ninth grade. We are dealing with students and the appropriate measures will be taken to stop the nonsense," Albert Aleman, principal of United High School told ABC News. While the administrators have started punishing the students, many others wanted to do something to actively support Nicole. Aleman said that many students, after hearing about the hateful comments, came out to support Nicole by wearing orange to school. "Quite a few of them are wearing orange in support of her," he told ABC News, explaining orange was the school color. The students called out on social media to have everyone wear orange to support Nicole. Nicole's mother wrote on her Facebook page that the whole community has turned out in support of the teen. "This morning as Nicole is getting ready to go to school she is beyond nervous," she wrote on Facebook. "What we thought of a simple post has had over 10,000 shares and our whole community supporting Nicole...Thank u to all who are wearing orange today in support for Nicole we will not stand for Cyber Bullying."